This time of year food blogs and websites are dominated by the usual Christmas fayre. A thousand ways to cook the perfect turkey, the best ever stuffing and knock your socks of roast ham. Same thing every year but with each chef or cook's own 'twist'. If you are like me and can see a turkey dinner far enough this could serve as an excellent alternative or as an excellent way to show off on boxing day. Worth noting that this is also a great value cut of pork with the joint costing just over twenty pounds. I fed 10 using only half the joint. So what is Porchetta? Basically, it's a rolled pork joint consisting of the belly attached to the loin. In Italy, they stuff it with various herbs, spices and offal that can be fairly offensive given the already rich-tasting meat. I therefore went with a simpler approach by letting the flavour of the pork shine through. I used mostly dried ingredients with the main flavours coming from dried fennel which complements the pork fantastically. For a touch of heat I used dried chilli flakes and for a savoury touch, I added dried garlic and onion granules. I served with a vibrant salsa verde which added a freshness which also balanced the dish by cutting through the fattiness of the pork. Start by making the rub by toasting the sage, fennel and chilli flakes which will encourage their flavours to be released. 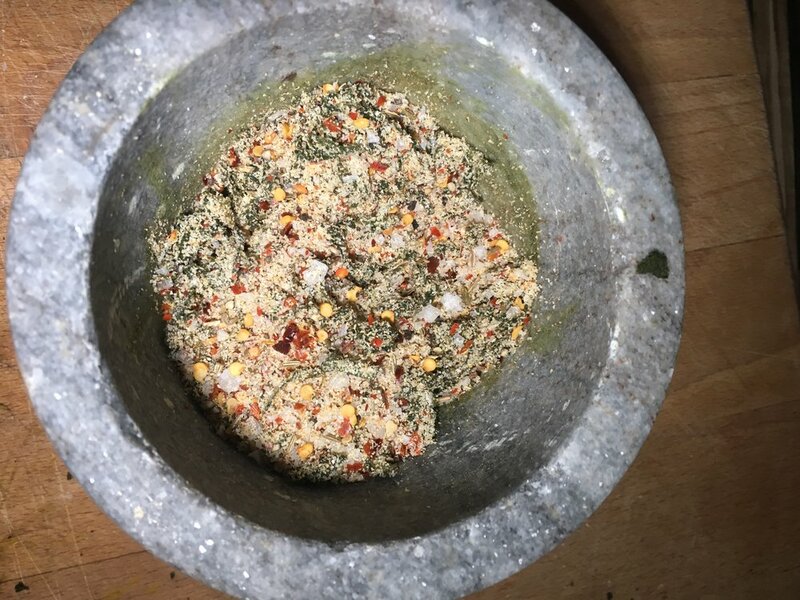 Simply toast on medium heat for one minute in a dry pan then transfer to a pestle and mortar along with the remaining rub ingredients. Bash everything together ensuring the fennel seeds are completely crushed and all the ingredients are combined. Open the pork out and score the insides in a criss-cross pattern that will allow the seasoning to penetrate the meat. With a sharp knife also score the skin which will encourage the fat to render and the crackling to form. The last stage before cooking is to tie the joint using butcher twine. Start at each end and work towards the middle by using butchers knots until the joint is secure. Place in the fridge and leave overnight. Before cooking ensure the pork is removed about an hour before and pre-heat an oven to max temp. Rub with some olive oil and sea salt to encourage the crackling. I set the oven to 220ºc then immediately dropped the temp to 140ºc and cooked for three and a half hours. After the three and a half hours increase the temp again to 220ºc and cook for the last 30 minutes. You are aiming for an internal temperature of around 60ºc to 65ºc. Remove and rest for 30 minutes before serving. I Served with fresh ciabatta and drizzled with the fresh salsa verde. Alternatively it would work fantastically well as a centre piece to a roast.